It’s amazing how many vintage reproduction or retro inspired brands there are across the globe! When I first started ordering online from retro inspired brands back in 2011 (ish), I was like a drug addict… finding a new website bought such a thrill and Miss Candyfloss in Sweden was one of those brands I discovered very early on. I ordered some separates which I’ve since sold on in various wardrobe clear outs over the years. They fell off my radar for a year or two for some reason or another (Facebook’s stupid algorithms are probably to blame) but their stunning designs are going to make more of a appearance here on the blog! 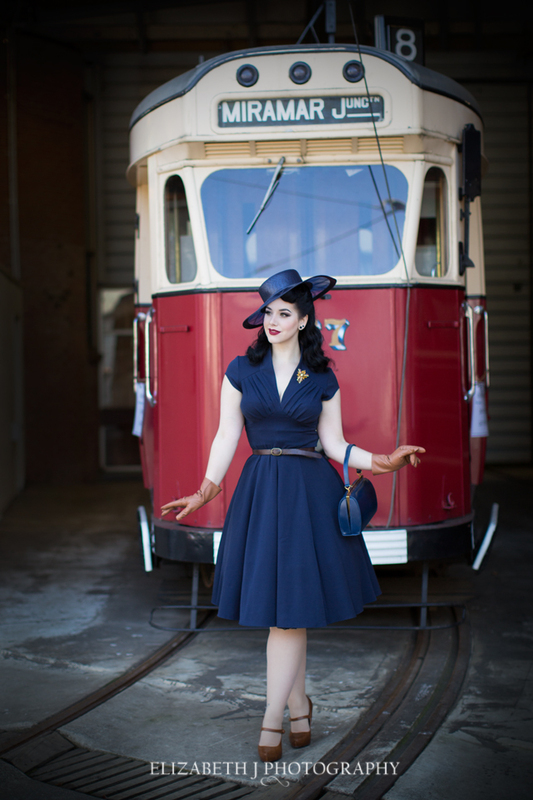 First up is the simple but sophisticated Odette Dress in Navy which fitted in oh-so-well at MOTAT Museum. I’m so accustomed to bright colours that having a Navy Dress to accessorize almost stumped me for a moment. I initially was just going to go with black but after taking a trip out to visit Lavonny at Tock Tick Vintage and brainstorming with her, we settled on tan and this fabulous matching navy hat! The Odette Dress has the fullness of a 1950’s style skirt but with a slightly more 1940s neckline, featuring a pleated bust and cap sleeves. The navy colour is lovely and rich without being too dark- I hate when a navy colour is so dark that it basically looks black in pictures. When looking at The Miss Candyfloss size chart, my bust (36″) puts me in the size medium and my waist (27.5) puts me in the size small. I’m wearing a size small which gives a very fitted look but I think a size medium would have been better for my shoulders and arms. The length of the Odette is pretty perfect for me- it stops below the knee but isn’t too long and I can wear my petticoat from That Shop without it showing underneath. Made out of polyester/viscose blend, this dress has a little bit of stretch but not much and the fabric has medium weight to it. For those of you in hot/humid climates, you might find this fabric a little too toasty. I adore the final look of the Navy Odette and tan accessories, it add such air of elegance but a little bit more casual. 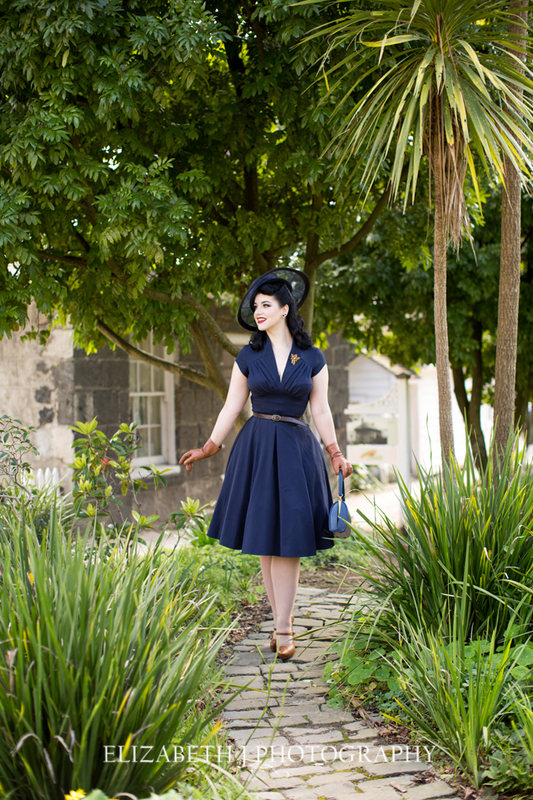 The Odette Dress also comes in 8 other colours, in sizes XS- 5XL and is €93.50. This style of neckline features heavily in a lot of Miss Candyfloss designs so if you like the look of it, have a browse through the rest of the styles. All pieces are made under fair trade conditions in Europe which is a fantastic thing to support. 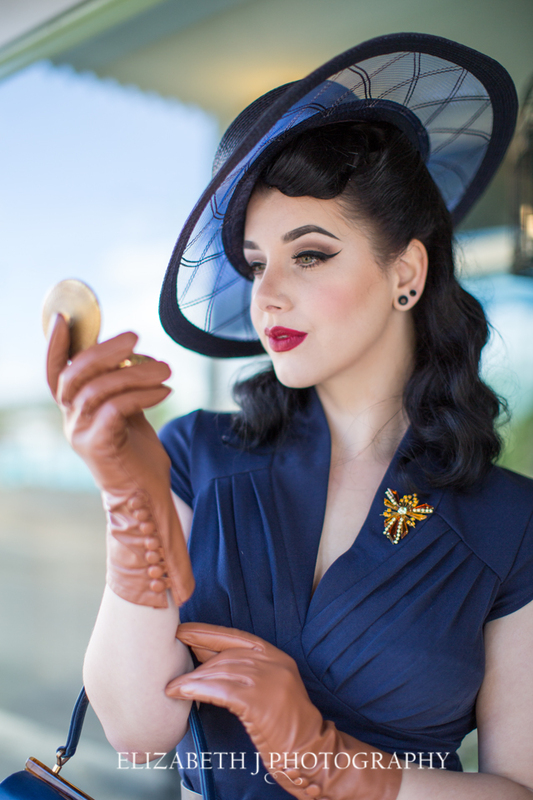 Thank you to Elizabeth J Photography for such wonderful photos and for bringing my 1940s vision to life! A big thank you also to MOTAT Museum for having us and also to Lavonny of Tock Tick Vintage for letting me loose in her shop! Love every inch of your outfit! Beautiful pictures! The gloves are my favorite with the buttons all down the sides. You look stunning in the blue as well. Ella, you really know how to wear a hat! Head to toe perfection! Just beautiful! sooo in love with this style, hat, and color on you!!! Stunning! You are a great beauty.